I want you to look at the quote and then think about your life right now. Are you improving because you want to or because you want to be accepted? Are you doing the things you do for yourself or for others? Don’t get me wrong, doing good for others is a great thing. But you should do those good things because you want to and not because people say you should. Do things because they make you feel good, because you enjoy them, and because they help you grow as a person. That last part is pretty important. Without it, we could take my statement to mean that we should do anything that makes us feel good. This opens the doors to all sorts of self-destructive activities – drug use, over-indulging on alcohol, excessive watching television or playing games, and more. While those things may make us feel good we have to think about their potential for increasing the value of our lives. If something doesn’t increase the value of your life, then it is an activity you should stay away from or severely limit. Don’t worry. This won’t make your life all work and no play. Nor will it make your life just a boring drudgery of work. Things like going on a vacation to the beach are fun, right? Well that would be something that you could do as it will enhance your life! Seeing the sights, spending quality time with family or friends, and just relaxing to recharge your life are all great things. Yet sitting on the beach every day for the rest of your life is unlikely to make most people a living or continue to benefit your life. 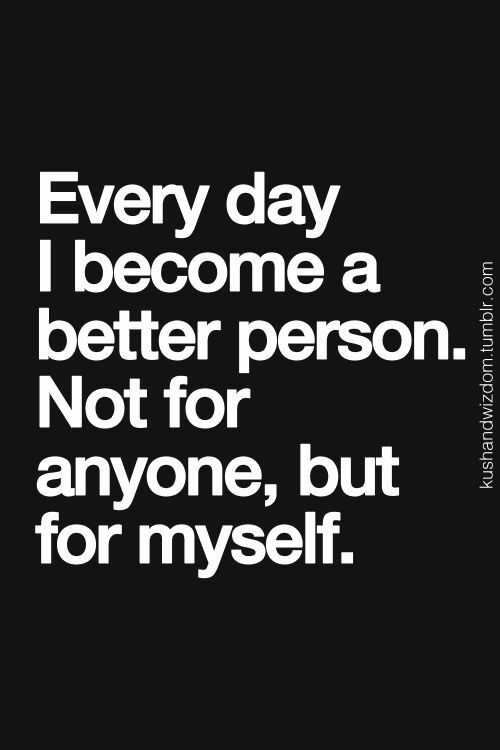 So what are you doing to become a better person for yourself? Are you learning a new skill like piano or painting? Are you learning to dance or studying to become a doctor? Are you writing on a blog or making funny videos? Whatever you do, do it because it is something you enjoy and because it is helping your life or has the potential to enrich it.